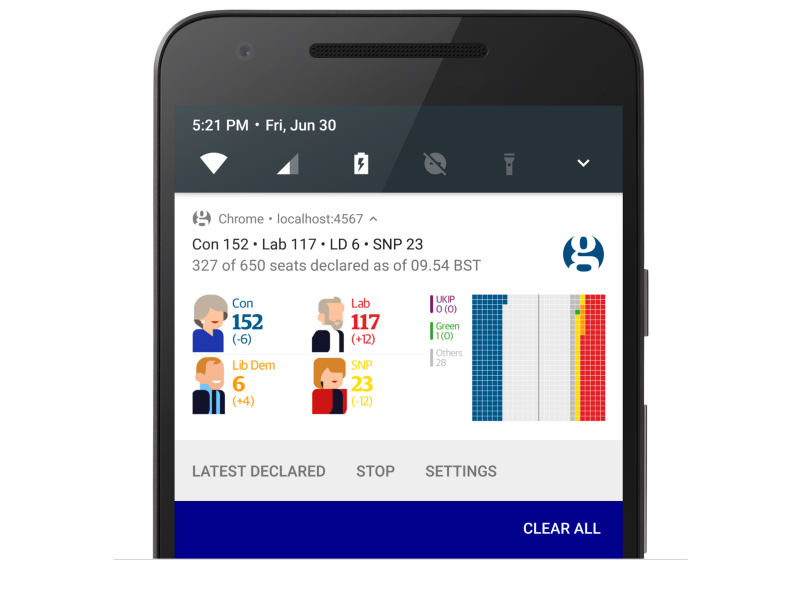 For the recent UK Elections the folks The Guardian wanted to show big images along with their push notifications. Being bandwidth-aware they wanted a solution in which they could use a template image (which could then be cached) and then draw some stuff onto it. Only problem: Service Workers don’t have access to the Canvas API. PngPong is a very, very basic replacement for the Canvas API in environments that do not support it – primarily, service workers. Instead, it manually manipulates the bytes of a PNG file to copy the contents of another image, or draw basic shapes (currently only rectangles). Inside addResultsToTemplate they heavy lifting would be done by PngPong, drawing some small rectangles onto the template pictured below, yielding a push notification as pictured at the top of this post. // and draw it 30px into our target image.